Trump, Cruz, Rubio blast Obama’s Oval Office ISIS speech. 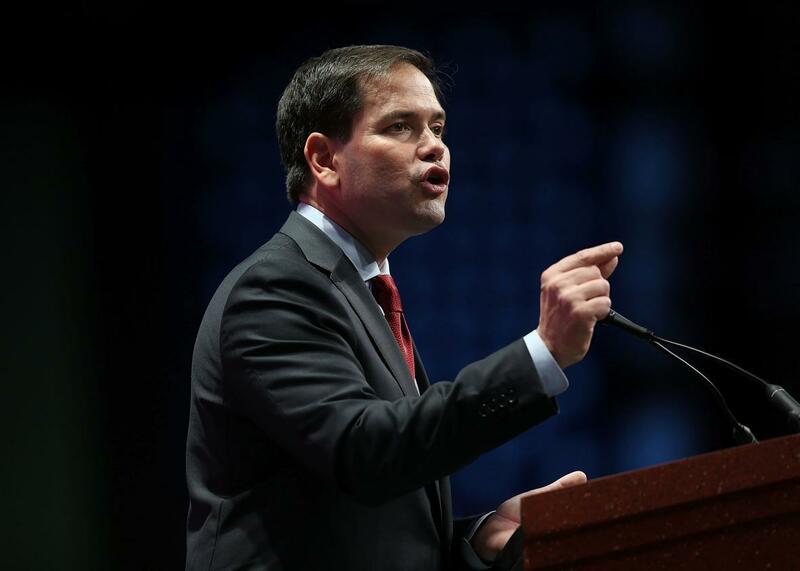 Marco Rubio speaks during the Sunshine Summit conference being held at the Rosen Shingle Creek on Nov. 13, 2015, in Orlando, Florida. Speaking from the Oval Office on Sunday night, President Obama attempted to soothe American fears about domestic terrorism in the wake of last week’s massacre in San Bernardino, California, and to convince the nation that that the United States would prevail in its fight against ISIS. The 13-minute speech didn’t break much new policy ground, though the president did get specific about what he believes the country should do (gun control, a new Authorization for the Use of Military Force) and shouldn’t do (launch another costly ground war, generally demonize Muslims). It’s unclear whether Obama’s calm-headed awareness of the United States’ limits is what Americans want to hear at this moment, but Republicans are banking on the idea that it is not. The GOP candidates wasted no time panning Obama’s remarks, taking issue with both his tone and policy prescriptions. In the process, they left it unclear exactly what they would do if they were in his position—though they made it painfully clear what they wouldn’t do: act anything like the man currently in the White House. Donald Trump took to his favorite medium to do what Trump does best. Is that all there is? We need a new President - FAST! "@homefreeee: @realDonaldTrump He needs to stop all Visas not look at them!" Meanwhile, Marco Rubio, now seen as the establishment candidate best positioned to win over the party’s conservative base, went as far as to suggest Obama had somehow managed to do more harm than good on Sunday night. “I think not only did the president not make things better tonight; I fear he may have made things worse in the minds of many Americans,” Rubio said during a Fox News interview. The Florida senator also managed to take issue with Obama’s decision to devote a portion of his speech to warning against anti-Muslim discrimination. “Where is there widespread evidence that we have a problem in America with discrimination against Muslims?” Rubio asked, apparently unaware of the existence of Trump or Cruz, two of the men currently leading him in the national GOP polls, or the growing number of death threats, assaults, and vandalism being reported by Muslims and leaders of mosques across the United States.